If you like calm waters and hot, hot sand, then a trip to Santorini's famous black sand beaches are an absolute must. Essentially the remains of a now-submerged volcanic caldera, Santorini is located roughly 120 miles from the Greek mainland and is often associated with the legend of Atlantis. 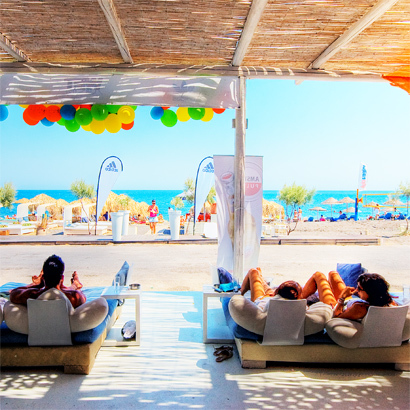 Perissa is one of the most famous beaches on the island and the surrounding area boasts a wealth of local tavernas and restaurants as well as a small but thriving wine industry. Beyond blazing hot sand, fine wine and startling sunsets, the volcanic island's mountainous terrain keeps Perissa well protected from the summer winds coming in off the Aegean Sea, the "meltemia."